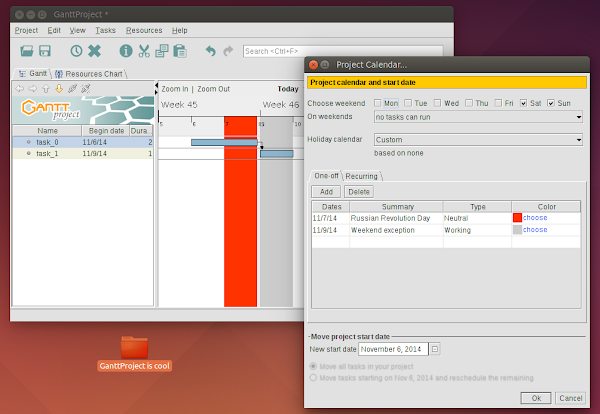 What's new in GanttProject 2.7? GanttProject 2.7, code name "Ostrava" (which is the third largest city in Czech Republic), is an evolution of GanttProject 2.5 and 2.6. It adds a few major features, fixes usability problems and bugs. A short overview of the major changes is given below. The cost of a summary task is the sum of subtask costs, but can also be set manually. Cost and standard rate can be shown as columns in task/resource tables, can be exported to PDF, HTML, CSV, and hopefully MS Project import/export is also aware of them. One more highly requested calendar-related feature is ability to make working some particular weekend day. For instance, in some countries if a holiday happens on Tuesday, it will be "merged" with the closest weekend, and Monday will be non-working too (thus we get 4 days looong weekend), but one of the next weekends will have one working day. Such use case could not be represented in GanttProject previously. In GP 2.7 it is possible to add "exceptions" and make particular weekends working. This feature sits in Project Calendar options page which is available via Project▶Properties menu item. We expect that files created in the previous versions of GanttProject should work fine in GP 2.7, and that GanttProject 2.6 can read files created in GP 2.7, skipping data related to newly added features of course. Please let us know if you notice any compatibility problems.